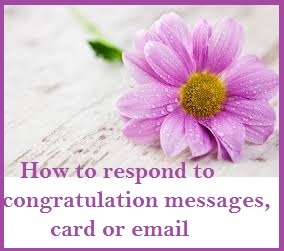 Although you may be too tired from the festivities of the wedding celebration; you must take out time to respond to the wedding congratualtions received from your loved ones. A short and thoughtful note is more thank enough to show your appreciation. 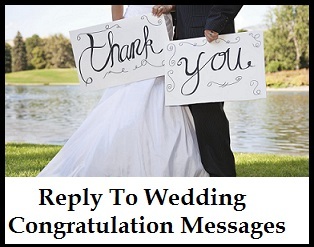 Here is a amazing collection of reply to wedding congratualtion messages that you can use. Thank you for your lovely message of congratulations. It was very encouraging and loving. Thanks a ton for your wishes. I felt blessed to be surrounded by loving friends like you. Thank you for your congratulation message. Thank you for your congratulation message. You are right. I am very blessed, indeed! Thank you, everyone. I received your heartfelt congratulations through a video and we are deeply touched by the effort. I appreciate your kindness to send us a congratulation message even though we are far apart. Thank you. Thank you for your meaningful congratulation message. I will remember your advice. Thank you for all the congratulation messages you have given. We are truly touched by the response and the flood of well-wishes for us. You are so thoughtful. Thank you for remembering us during our wedding. Thank you for your kind words of congratulations. We will cherish the memories of the wedding forever. Thank you for your congratulations. 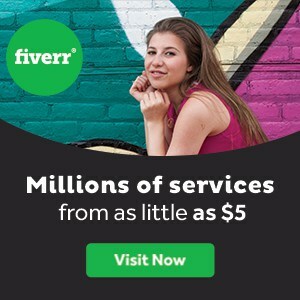 It wouldn’t have been possible without your help as well. Thank you for your well wishes. I hope we can meet up again soon for a longer chat. Thank you for your lovely messages of congratulations. 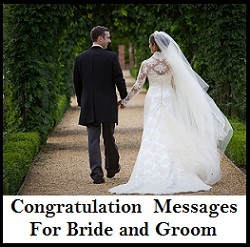 Each message added to the cheerful spirit of the wedding. Thank you for the message of congratulations and also for the gift. We will never forget you. We cherish all the heartfelt well-wishes we received on our facebook wall. Thank you very much from the bottom of our hearts. You made our wedding day extra special. 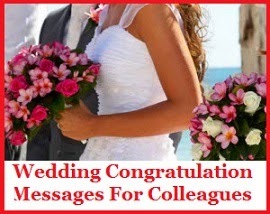 Thank you for making us feel special with you wedding congratulation messages. Your kind words of congratulations made us smile. Thank you! Thank you so much for thinking of us and sending well wishes to start our married life. We will cherish your kind words. Your words are golden. Thank you for your encouragement and well wishes on our wedding day. Thank you for taking time to drop me a note of congratulations! 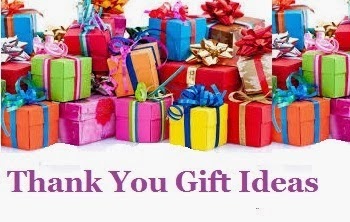 We are deeply grateful for your thoughtfulness. Hi! It’s good to hear from you again. Thank you for remembering us on our wedding day! It feels great to receive tons of congratulatory messages on our wall. Thank you so much. Thank you for your kind words and well-wishes on our wedding day. You will always be remembered. The engagement of a couple is a happy occasion. In some cultures, this is formalized through a ring ceremony. 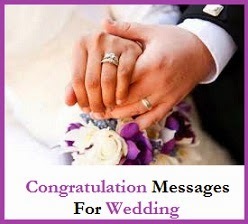 Express your happiness for the couple by sending a message of congratulations after the ring ceremony. 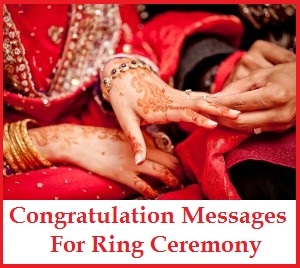 Here is a amazing collection of congratulation messages for ring ceremony to choose from. 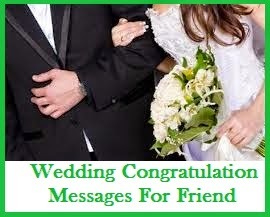 Go ahead and find the perfect heratfelt congratualtion wishes for the newly engaged couple right here. Congratulations! I wish you all the best as you proceed on planning a new life together. True love wins at any cost. Congratulations on your engagement. I am thankful to have witnessed your ring ceremony. It was a special new cultural ceremony for me. I am happy to be a part of your ring ceremony. Congratulations to both of you. Lots of love and a lifetime of bliss is my wish for both of you. Congratulations on your engagement. It’s official! The wedding plans start here. But first, let me congratulate you on your engagement. I bet you’re truly ready now for the challenges ahead. All my best wishes to you both. Congratulations on your engagement, buddy. When I you as a couple, I foresee forever. Congratulations! I wish you a lifetime of happiness. Cheers to a couple I both love. Congratulations! I wish you love, good health and prosperity for a lifetime. Congratulations to both of you. I am very happy that you have found love in each other. May your bond stay strong for life. Achievement unlocked. Your engagement is a milestone to cherish and to hold for each other. Congratulations. I wish that the love you have for each other will grow stronger as you stay with each other longer. Congratulations! I can almost hear the wedding bells sing when I witnessed you exchange your precious rings. Congratulations! I am happy for both of you. Cheers to the most adorable couple I know. Congratulations on your engagement. May your love for each other stand all the test of time and temptations. Congratulations! Congratulations! You truly are the best for each other. I wish all that your love, happiness, and trust for each other will last forever. Congratulations on your engagement and ring ceremony. How wonderful it is to see two hearts committing a lifetime of love for each other through this ring ceremony. Congratulations to both of you. May true love be your guiding light as you take each other’s hands towards a future together. Congratulations. You make a perfect pair. This ceremony seals the wonderful commitment to go further into the heights of lifetime love. Congratulations! Now that the rings are on. I look forward to a lovely wedding soon. I am so happy for both of you. Congratulations! Your journey to the altar starts now. I am looking forward to the day you exchange you vows. Congratulations! I am happy to see you both wear your engagement rings. Soon we will hear the wedding bells ring. Congratulations to both of you! 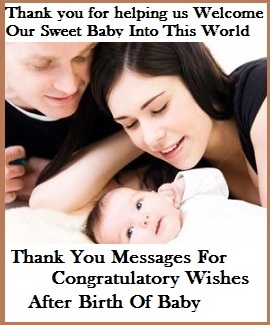 Send your heartfelt congratulation messages to show the parents how happy you are for the naming ceremony. 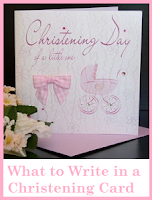 Make it sincere and brief enough to fit in a gift card or small piece of paper attached to the gift for the baby. 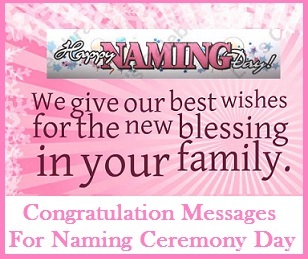 Read on to find the perfect congratulation messages for the naming ceremony day. May your child be blessed and protected by God’s wonderful love. Congratulations! Just like the name, your child is truly a blessing to you and to us all. Congratulations! May (baby’s name) grow in the tight circle of love and protection from family and God above. Congratulations! Congratulations! Your baby is as adorable as you are. May the blessings of love and protection be upon you all. Today is special among other days. Congratulations to your family on this naming day. A name so special and so sweet is just as perfect for a lifetime to keep. Congratulations! 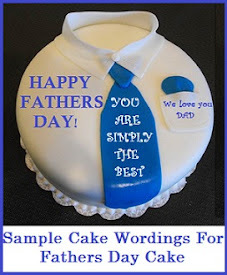 Best wishes to your family as (name) is named this day. I wish you a life filled with blessings and happiness. 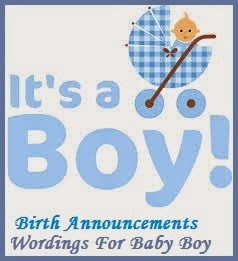 Congratulations on your naming day! Best wishes for a lifetime filled with love. 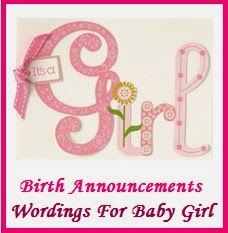 Congratulations (baby’s name)! Thinking of you on your very special day. With lots of love, Your Godmother. Hugs, kisses, and best wishes. Congratulations on your naming day, Baby (name). Congratulations on your naming day, Baby (name). May your life be filled with lots of love and happiness. 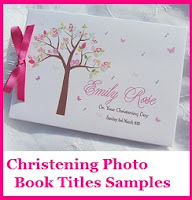 Congratulations on your baby’s naming ceremony. Thank you for inviting us to this wonderful occasion. Congratulations on this first milestone of your life. May you experience the joys of life to the fullest! Today is a wonderful and joyous day. Congratulations, Baby (name)! All the best to Baby (name) and the family. May your life be full of memories to cherish. Blessings and love come to your on this wonderful day and for your whole life through, Baby (name). Wishing you continuous blessings from God above. Congratulations! May this day be the start of a faithful life and lasting faith in God. Congratulations! 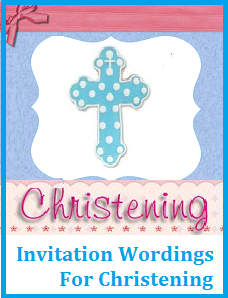 Congratulations on your naming day. May today be as special as all the days of your life. Wishing you and your baby all the best that life can give. Congratulations! The moment I saw Baby (name)’s name, I knew he/ she would be an adorable little angel. Congratulations! When your friends and relatives send you congratulatory messages for your new baby, it’s great to reciprocate the gesture by sending them a reply. Simple thank you wordingss from the heart will be enough to acknowledge their message and to show them that you appreciate the thought. Here is a collection of reply to baby congratulation messages that you can use to convey your gratitude and thanks to your loved ones. Thank you for the well wishes for my new born. This feeling is just amazing. I do pray that my baby would be healthy and happy all his life. Thank you for your well wishes. You’re so sweet. Thank you for your kind and lovely thoughts. Baby is just all smiles now. If only my baby could talk, he’d wish you the same. God bless and thank you. Thank you for your well wishes. Our little bundle of joy says hi. Thank you for the greetings on the occasion of me having a baby. It was good to hear from you. Thank you for your encouraging message. It was great to receive congratulations messages from you.Thanks! I appreciate all your well wishes. Thank you so much. I was really pleased with you well wishes and greetings. I am thankful for colleagues like you who remember this occasion. Thanks for taking the time to send your well wishes. Thank you for your kind message. Yes, it was a team effort. Thank you for the support. I appreciate the gesture of dropping me your note. It’s good to know that friends like you are thinking of me. Thank you! Yes this time we were lucky. Thank you for your well wishes. Reading your message filled me with happiness. Thank you. I am lucky to have friends like you who think of me and our baby’s well-being. I am so blessed to be surrounded by people like you. I feel great to have a friend like you. Thank you for your well wishes. It’s great to have friends like you around. Thank you. It was great to read your note. That was really sweet of you. Thank you. 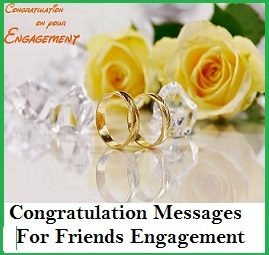 Engagement wishes always bring happy thoughts of love and happiness to the engaged couple. Belated engagement wishes are still worth sending. 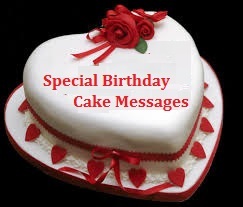 So if you have forgotten to send engagement congrats to your friends send belated congratulation wishes right away. 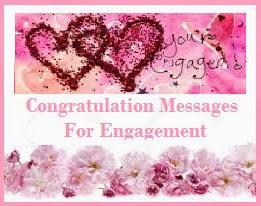 Here is a collection of belated engagment congratulation wishes. I am so happy to hear about your engagemennt! I just came to know last evening. Sending you loads of love and congratulations to both of you. Best wishes to the happy pair, at last you are getting married. I am sorry this is quite late! I hope it is not too late for me to congratulate you for your engagement party. When you introduced your boyfriend to me five years ago, I knew he will be the one for you. Congratulations you are engaged now! Sorry for being late. Sorry my wishes are reaching you quite late. Congratulations on your engagement! I wish all the best until your wedding day. Your love will finally be sealed on your wedding day, I am happy to hear about the engagement. I am so sorry I was not able to come to your engagement party. Your dream of becoming one will finally come true as you tie the knot on your wedding day. 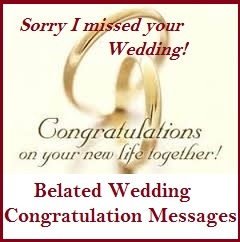 Congratulations and best wishes to both of you, I am so sorry this message came late. I still believe that it is better late than never. Happy Engagement my dear brother! At last, you are getting married. 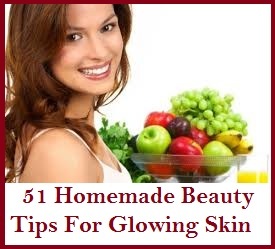 It is about time for you to settle down with the lucky woman, Cheryl, my future sister-in law. I am sorry this note is quite late. Happy Engagement to the wonderful couple! Sorry I just arrived from my travel abroad; I was not able to attend your engagement party. May God always bless you as you begin your marriage journey from your engagement party. Congratulations! Looking forward to a lovely future for both of you. I am sorry I missed your party, you know the demands of my work in the hospital. I am excited to see you soon, dear. Engagement party news is always a wonderful thing. Sorry, I missed it, but I sincerely wish you the best as you start a new chapter in your life. May the whole wedding preparations will be smooth and hassle free. I cannot wait to see you walking the isle. Congratulations! Belated engagement wishes for you and Charles. Best wishes on your engagement, unfortunately, I missed the party. May your dreams come true as you start a new life together. Congratulations on your engagement! I am sure you will be a wonderful couple, I wish you joy and happiness in your marriage life. Congratulations! A bright future is coming ahead as you officially announced your engagement. I am sorry I missed the party. May your love grows more after your engagement party, until your wedding day, and thereafter when you start a new life together in marriage. Belated wishes for your engagement. A wedding is one of the most important events in one’s life. 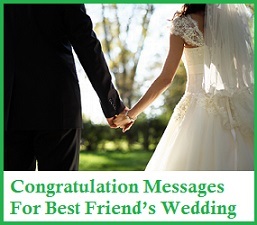 If you forgot to send your wedding wishes to the couple in time, sending a belated congratulation wedding message is a must. Here ia a collection of thoughtful belated wedding wishes to choose from. I am sorry to have missed your wedding, but I wish this message is not too late. Belated Happy Wedding, I am sure it was a blast! I was the first who got excited about your wedding, but for personal reasons I was not able to come on your wedding day. I know you will be both happy together, Congratulations to the new Mr. and Mrs. Smith! Belated wishes for my two best friends, I am happy for both of you! I would like to know that you are in my thoughts especially on your wedding day. Congratulations to both of you. It is never too late to wish you happiness and long lasting marriage. Best wishes! Congratulations to the newly-wed couple. I know I have missed the celebration, but you were in my thoughts and prayers on that day. I wish you a lifelong and blissful marriage. I am very sorry I missed your wedding. Congratulations to both of you, may your marriage will be a happy one and be blessed by many kids. Your union is a celebration of your special love. It is unfortunate that I was not able to witness the ceremony last (date of wedding) I am sure you had a great celebration. 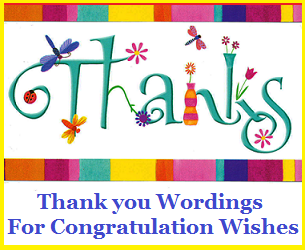 My congratulations note is a bit late, I still want to extend my warmest congratulations. God bless the two of you always. Congratulations to my dearest cousin, you know how important your wedding day to me. Because of my work training abroad, I failed to come. Wishing you and Charles a great time together in marriage. Congratulations to a brighter life together. Belated happy wedding! Greetings to a great couple, my congratulations of love and happiness will always be with you. Wishing you joy and everlasting happiness. Happy married life to both of you. I heard it was a great affair, I wish I was there with you to witness the special moments of your life. When you walked the isle, the ceremonial “I Do”, and the fun-filled wedding celebration at the reception. 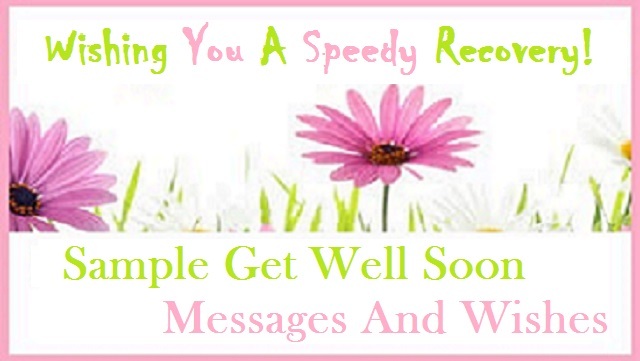 Unfortunately, I am still in the hospital recuperating from my illness. I hope to see you soon with your husband. Congratulations my dear friend. I saw your Facebook postings of your wedding. The photos showed it was a blast and had a momentous wedding celebration, I regret I was not able to come. Congratulations to you and your husband, Harry, may you have many years together. Hi Andrea, I am so happy about your wedding but really sorry for not attending. As your mentor and friend for almost ten years, I know that you have dreamt of this life. May the Lord bless you in this journey, congratulations! I hope this message was not too late. I am sorry for not attending your wedding. I thought I can go back from my trip abroad in time for your wedding ceremony, but my employer did not allowed me to go back earlier. Wishing you the best in life with your wife. Forever together! Congratulations to the newly-wed couple, I felt terrible that I am not around for your wedding. May your marriage be guided and love-filled always.